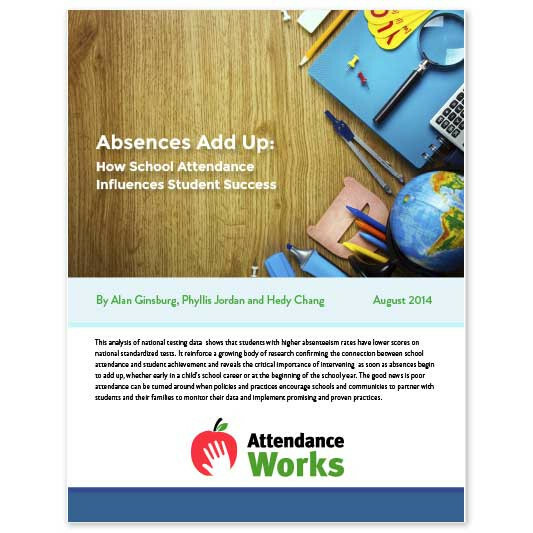 Ginsburg, Alan, Phyllis Jordan and Hedy Chang, Absences Add Up: How School Attendance Influences Student Success, Attendance Works, August 2014. This state-by-state analysis of national testing data demonstrates that students who miss more school than their peers consistently score lower on standardized tests, a result that holds true at every age, in every demographic group, and in every state and city tested. The analysis is based on the results of the 2013 National Assessment of Educational Progress (NAEP). It compares attendance rates and NAEP scores for every state and for 21 large urban areas. These supplemental tables provided expanded information on the national trends shown in this analysis.